Maybe this is why people say they hate to cook. For something as supposedly simple as mixing a few ingredients together, the hidden details that you don’t realize when you first start making food for yourself might be enough to make a novice throw in the towel. Or throw a measuring cup across the room in a fit of rage. And one of those things that falls under the G.I. Joe dictum (“knowing is half the battle“) is the most foolproof and accurate way to measure liquid and dry ingredients. I’ve said it before, but the best way to guarantee accuracy and consistency when measuring isn’t to use cups or spoons; it’s to use a kitchen scale. As you’ll see in the video accompanying this post, even careful measuring by volume has a margin of error, and being able to dump ingredients into one bowl set atop a scale is much less messy and leaves far fewer items to wash once your food goes into the oven. Measuring by weight means you won’t be scooping honey out of a measuring spoon or trying to level off cocoa powder without getting a fine dusting all over your counter. If you love one-pot meals, you should try one-pot measuring and see how it goes! It’s also an easy way to keep your portions under control. Can you eyeball a 2-ounce serving of pasta? Do you know what 3 ounces of salmon looks like? How about 1/2 ounce of nuts? These are recommended standard serving sizes, and it will help both your budget and your waistline to make sure you’re eating the right amount. 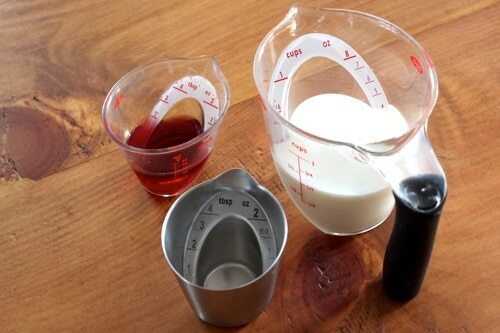 But if you continue to measure by volume, it’s important to know which measuring cups you should be using for which ingredients—and why adding your ingredients to the measuring cup in a certain way makes a difference. First things first: there are different measuring cups for liquids and solids for a reason. Say you need 1 cup of water for a recipe, so you turn on the faucet and start filling up your basic metal measuring cup. But you can’t fill it to the tippy top or you’ll spill water everywhere as you carry it from the sink to the mixing bowl, so you might leave 1/8 inch of headroom between the lip of the cup and the water line. Guess what? That might be just enough space for an ounce and a half of water, so you’re only putting 6.5 fluid ounces into your recipe instead of the 8 fluid ounces (1 cup) it calls for. Whoops! That’s why the liquid measuring cup was invented. It’s always got headspace so you can get the full cup (or two, or four) of liquid into your recipe without wobbling, spilling, and mismeasuring. Three cheers to OXO for inventing the angled measuring cup—no longer do you have to crouch down to counter level or lift a sloshing measuring cup up to eye level to make sure you’re getting exactly the right amount of liquid. For mayonnaise, molasses, peanut butter, and other sticky, goopy ingredients, there’s an adjustable measuring cup> with a plunger function. 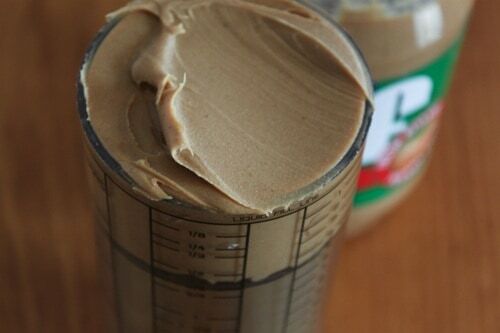 It lets you fill every last nook and cranny, then self-scrapes the sides of its plastic tube as you push the ingredient into the bowl. That leaves the standard metal or plastic measuring cups and spoons for all other dry ingredients. 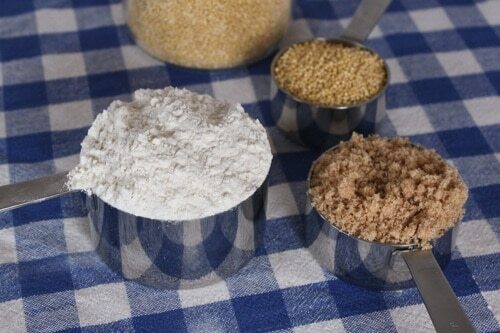 But there’s one more crucial tip for making sure you get the same amount of flour, sugar, cornmeal, or other powdered items into your measuring cup time after time. It’s that spooning and leveling dry ingredients is much more accurate than dipping and scooping with the measuring cup itself. Watch the video to see why weighing is the best measurement method, and why the “spoon and sweep” method gives you a more accurate measurement than the “scoop and sweep” or even, heaven forbid, trying to measure dry ingredients in a liquid measuring cup. Yes, I know this is a controversial stance for you scoop-and-sweepers. There are some high-profile scoopers out there, including Ina Garten, Dorie Greenspan, and Julia Child. But the weight on the scale doesn’t lie. That extra ounce you’ve scooped into your batter could be the difference between the best brownies of your life and tough, chewy brownie bricks. All Good. Food. Stories. recipes include weight measurements where appropriate, and I hope you’ll take full advantage of them. As added encouragement to get more cooks comfortable using their kitchen scales, King Arthur Flour keeps an incredibly comprehensive Master Weight Chart. Hit Control-D and bookmark it ASAP!